Sound Worthy Of A King! 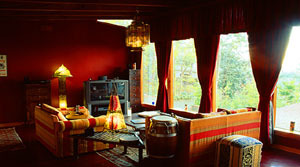 The New King Sound motto is: "We intend to make your stay comfortable yet economic. Extravagant yet prudent, Lets just say your wish is our command," says Jimmy Sloan. Who wants to spend all the advance money on recording your album? Welcome to King Sound where vintage gear rules. Yes, they offer the ProTools HD too. The New King Sound is a residential recording studio with two bedrooms, two bathrooms, a large galley/ gourmet kitchen, tracking/living room, dining/ control room, Jacques/fire-pit/deck, desert patio/garden. Producer/studio owner, Jimmy Sloan, a musician himself opened up King Sound & Pictures in LAs Fabulous Fairfax Delta. 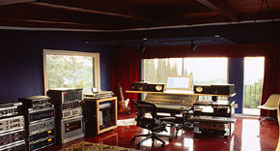 The Pico/Fairfax area of Los Angeles became the real home to the Silverlake Sound where everyone from Social Distortion, J.Lo, Michelle N' Degeocello, Weezer, The Offspring, Scritti Politti, Della Reese, Rod Stewart, Christion, and Monster Magnet, to The Blind Boys of Alabama (Grammy Nominated), Ben Harper, The Carter Brothers, The Watts Prophets, Lift Ticket, The Hangmen, Nikka Costa (certified gold), and Jack Johnson (certified platinum) worked from 1991-2001. Also available at New King sound are Vintage Guitars and Amplifiers - for full list of gear visit the studio web site. Reinvent or Die: The New King Sound opened its doors in September of 2002 and has since then recorded the likes of Fishbone, Kenny Wayne Sheppard, The Warlocks, Phranc, Scenario Rock, Greg Dulli, Rhino Bucket, Paul Plagens,The Slum Lords, The Tyde and is currently is Brent Rademaker's (Beachwood Sparks) solo album on Subpop. In 2004 Sloan plans to launch a record label under the New King Sound name with Fishbone headlining. Local favorites Lift Ticket and Shane Walsh to follow on the new label. "I can offer the same promo people that major indies use while offering more dedicated people who stand behind the artist. Fishbone already has a huge fanbase, so the tour will support the new record initially," says Jimmy. Fascinated with vintage recording equipment, Sloan started buying and selling gear in the early nineties. I "I kept my stash and thats what The New King Sound is today. A lot of the old (Vintage Neumann and AKG mics, Neve Mic-Pres, Fairchild limiters) and a bit of the new (Pro Tools HD, Apogee 96khz 24bit converters). Lately, I have been getting in to mastering. I realized I have the same gear and just as good of a set of ears as the mastering elite of LA." says Jimmy. Above all, KingSound offers a relaxed atmosphere, classic project recording at its best-- some of the best recording Joshua Tree to the band were recorded in residential. This special vibe and affordability appeals to new artists and out of towners who, had to find the right house, do modifications and bringing an acoustician to treat the main tracking room and do it tastefully, then you've got to wire up everything. You can save time and move right into the New King Sound. 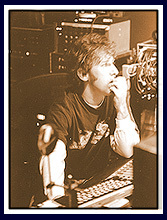 Besides producing The Hangmen, Gifthorse, Lift Ticket, and The Carter Brothers, to name a few, Sloan has engineered for The Blind Boys of Alabama, The Offspring, Wayne Kramer and Brain James, Busta Rhymes, Rod Stewart, Fishbone, Kenny Wayne Sheppard, Della Reese, Phranc, The Warlocks, Greg Dulli, The Watts Prophets, Jennifer Lopez, Weezer, Scritti Politti, etc.